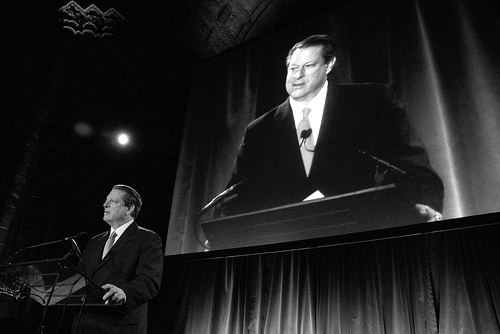 Al Gore giving keynote speech at World Resources Institute’s 25th Anniversary Dinner. Photo by World Resources Institute on flickr. This month Al Gore addressed the gala dinner at the India Today Conclave, a three day conference on “Leadership for the 21st Century” held in New Delhi. At the Conclave, Al Gore very passionately described climate change as a planetary emergency and said advanced developing countries like India can be the leaders of the 21st century by taking actions towards combating the climate crisis. During his talk, Gore acknowledged that his own country was a big part of the problem. Asking why other countries are not doing enough to address the climate crisis, he said “India has a big role to play, India is not doing it because the U.S. is not doing it. We share each other’s excuses for not safeguarding our planet”. The diverse audience, consisting of leaders from government, the private sector, and even Bollywood, applauded his recommendations for solving this crisis, which included implementing carbon taxes and changing people’s mindset on the issue. During his trip to India, Gore also met with India’s Prime Minister and addressed the members of the Indian Parliament. In addition, he led a training program of 100 men and women from all over India who will now conduct climate change awareness campaigns across the country. I hope his earnest message to India makes a real difference and that the same independent drive and spirit that has contributed to India’s vibrant economy will now help India take the lead in protecting the future of the planet.